My daughter is currently refusing to give her son this vaccination -and I think she is using homeopathy instead. She also maintains that she did not decide this because of my influence! I have however done a great deal of research on some vaccine issues - and I recently read the minutes of a medical professional gathering on the submect of vaccine safety. At this a UK government doctor reported that the manufacturers could not meet the previous recommended levels of vaccine purity - and would be hard pressed to meet the new recommended levels - even though they now required ten times less purity! i will try to dig this up and will post it on my www.sparks-of-light.org website. AIDS - the many causes - click To summary of second part. The above are pre-print summaries of two major new articles on HIV/AIDS now with their publisher and due out in print later this year. Readers are warmly invited to send in comments. The science in them has been carefully checked by many eminent scientists. Now it is time for you to have your say. 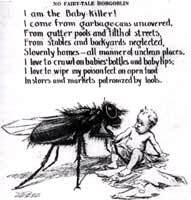 This poster appeared during the time when they thought a still undiscovered virus was causing the polio epidemics - a virus that must be spread by flies. Such adverts led to a greatly increased use of insecticides - which tragically were found by leading scientists working for US government agencies to cause precisely the same kind of paralytic damage to the spinal column nerves that were found in cases of polio. Their research simply was ignored. how isolation of this virus should be done so it can be used, say for a vaccine. It instructs, first obtain from the patient a small sample of urine or fluid from the nose or mouth. The first 90 or so pages of Janine Roberts' book (1) convey insights relevant to autism, vaccinology, and models of disease. I've read to page 96 thus far, and much of the rest of the book seems focused upon HIV. She documents most of her technical assertions, and the text would have benefited from a technical-writing editor. Nonetheless, Fear of the Invisible is important. For instance, she presents a convincing argument (with citations and sources) that the viral model of polio was artificially enforced, that the viral model turned attention away from pesticides which produce polio-symptoms, that detox-like reversals of polio were ignored, that polio continues even as most of its symptoms have been redefined so as to make "polio" epidemiologically invisible, thus allowing official statements about polio vaccine efficacy. This section of the book calls attention to models of illness. Since polio virus is common and generally harmless (cites in book) and since most children naturally have polio titers (without vaccination), why is there such strong enforcement of need for a polio vaccine - especially since polio epidemics coincide with pesticide use (cites in book)? Smallpox vaccination seems to have worked, and upon that success, additional vaccinations (and patents thereon) have been the dream and basis of many careers. However, subsequent vaccines and vaccinations are fraught with problems, problems that the CDC, AMA, and FDA would prefer be ignored. As I read towards p96 was that this book, I couldn't help but feel it makes an important contribution, as significant as Kirby's EoH summary of the thimerosal controversy.